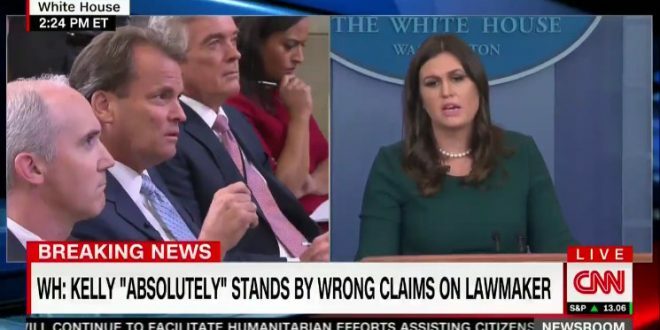 White House Trashes Press For Daring To Report About Proven Lies By A "Four-Star Marine General" [VIDEO] - Joe.My.God. The White House on Friday said that its chief of staff “absolutely” stands by his false comments about Rep. Frederica Wilson (D-FL), despite video evidence proving him wrong. While railing against Wilson’s criticism of President Trump’s call with a Gold Star widow, Kelly told media on Thursday that he recalled Wilson grandstanding during a somber FBI event in 2015, touting herself as having secured funding for a new building. However, the Sun-Sentinel found the full speech video and it contained no such boasting. Sarah Huckabee Sanders logic: it’s okay that John Kelly lied because he’s ex-military. Sanders seems to suggest it’s inappropriate to question Kelly’s story — even though we have a video that indicates his account was false.